Just wanted to let everyone know that I'm on vacation this week. I'll be back with a vengeance next week. 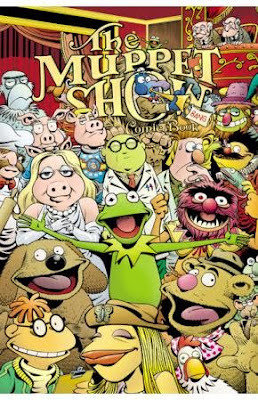 This hilarious trade collects the first four issues of THE MUPPET SHOW, written and drawn by the incomparable Roger Langridge! Packed full of madcap skits and gags, The Muppet Show trade is certain to please old and new fans alike! If you have a favorite Muppet, chances are it's featured in this show-stopping collection! I held off on getting the single issues of this one, even though everyone and their mother was going ga-ga over how hilarious and wonderful and oh-isn't-Roger-Langridge-just-PERFECT-for-this-book and it's-not-just-nostalgia-talking-no-really and awesome this book is. I'm hoping it lives up to the hype -- I've bought some of Boom's other kid-friendly output for my kids (Cars, Toy Story) and haven't been impressed. The Muppet Show is another animal altogether, however. I'll just say that I'm looking forward to it. Howard the Duck to be de-pantsed. Is Ponyo too scary for kids?